The beginning of last year I was drooling over a plaid wool cloak in the Met and a similar plaid fabric for sale at FFC. It's true I may have spent a lot of time in museum websites, and looking at FFC fabrics. I would even have been tempted to buy the orange plaid except that yellow and orange make me look severely jaundiced. Not just a little, but deathly and nobody wants to look their worst. Well no reasonable person. I'm not that crazy. 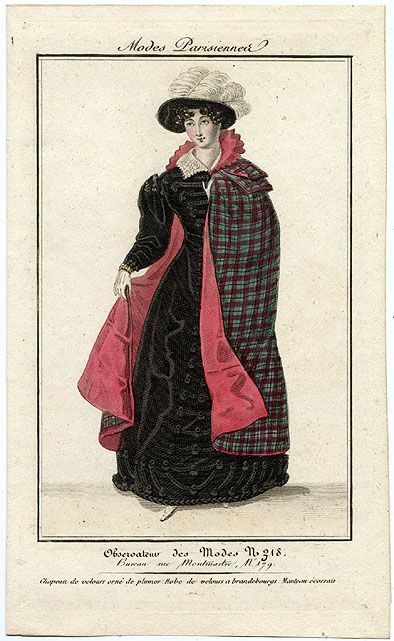 On pinterest I've tagged 5-6 extant plaid/tartal cloaks from the early 1800s including a fashion plate. They all seem to have a collar and capelet/s and no hood. Which is a bit sadmaking as there are definitely plain and print cloaks with hoods in this time, but I haven't found a plaid cloak with hood until mid 19th century. The fashion plate is appealing, found on Robin's Plaid Regency page though in my fabric it'd be less vibrand and more muted like the cloak in the Killerton collection fo the National Trust UK (item number 1360836, c1820-30, lady's travelling cloak). Part of me - the heart part - wants to make this for the regency weekend at the end of October, but my head is telling me to make the hooded scarlet wool cloak/cape first. 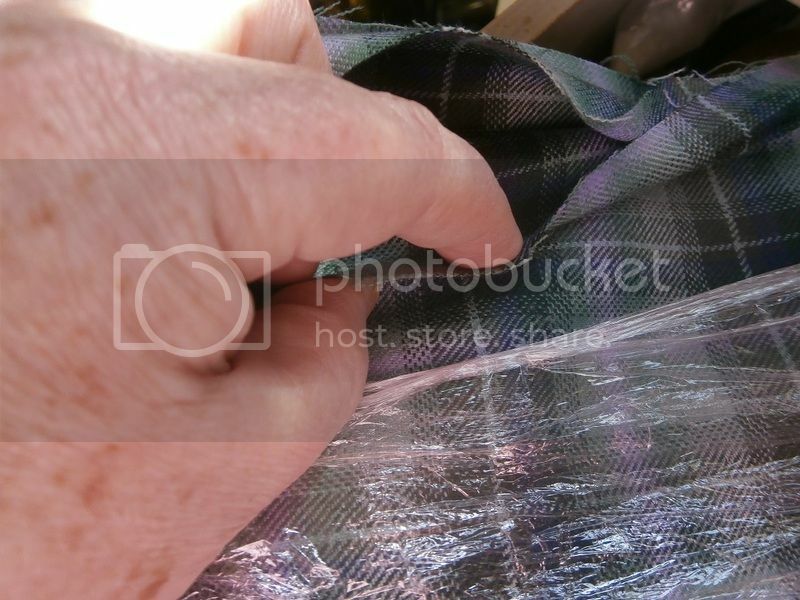 Partly cos I've had the fabric longer. Also I know that I tend to plan more than I can achieve, so a plain hooded cloak is easier and more likely. 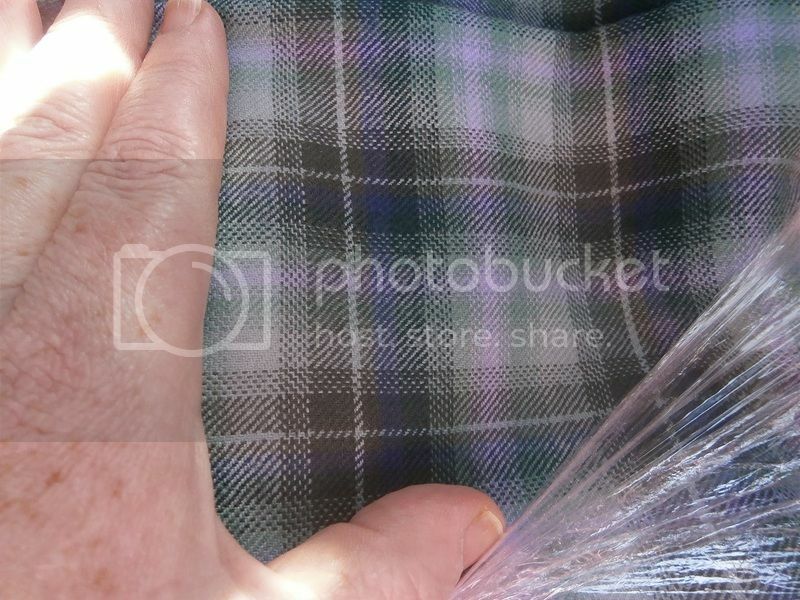 Tartan!!!!! Such a lucky find. So lucky i spotted it and pounced before someone bought 1m of the 5. It's not a square, but horizontal oblong (not quite as flattering) but delicous. Mmmmmmm..... warm things for October! Wnt cloak AND pelisse! oh dear, you've reminded me that I want a hoodie pelisse. I have 5m of pale green wool from 1988. ummm.